Lume Design’s Emma Gourdie has an artistic eye and talent for design, both being recognised at the recent National Kitchen & Bathroom Awards (NKBA). 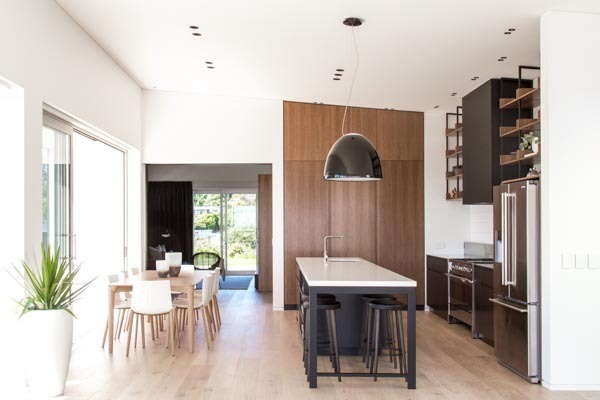 Emma’s Hackthorne Road kitchen design, precisely executed by Joinery Concepts, won her the Kitchen Distinction Runner-Up title (in the $40K-$60k kitchen category). Among other things, the judges praised her entry for its refined industrial aesthetic. Emma ensured that a balanced approach was applied to the parallel use of timber veneer, paint lacquer, matt black steel, stone, and brushed stainless steel. In addition, there’s an inventive interplay between light and dark areas, including the interiors of drawers and cupboards, in matt black. All details are fitting for a kitchen designed for foodies and avid cooks. “The design brief included mention of the owners’ favourite Auckland restaurant, Al Brown’s Depot, with its cool industrial vibe,” Lume Design’s Jeff Merrin says. Emma aimed to maximise storage while allowing for plenty of sociable bar seating. She incorporated a full, concealed working pantry behind large pocket doors. Contact Lume Design on 03 377 7541 or see them at 192 St Asaph Street, Christchurch (from 12 November 2018) or visit www.lumedesign.co.nz.